President Cavaco Silva attended the Empowerment Ceremony of President of the Republic Marcelo Rebelo de Sousa, held in Parliament House. 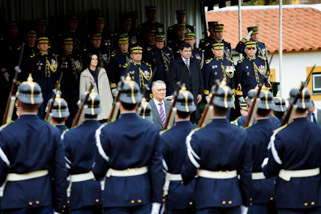 The President of the Republic received military honours from the Presidential Squadron of the National Republican Guard before leaving the Palace of Belém, upon concluding his two presidential mandates. The President of the Republic addressed a message to the Portuguese.